"When Avon Self Storage started, over 6 years ago, we were looking for a Storage Unit supplier. Out of the many we contacted Triple Eight were the only one that came recommended by several other Self Storage companies. Over the years they have offered us good service at competitive rates. We look forward to continuing working with them"
Whether you wish to purchase a single container or lease purchase one hundred, we have the package best suited to your requirements. We are pleased to sell you containers directly from the depot in our nationwide network which is closest to you in order to minimise transport costs. We happily arrange delivery at cost to you with one of our wide range of haulage contractors. Vehicles will always be equipped with HIAB lifting gear to place each container where you designate on your site. 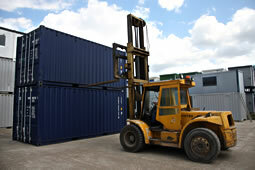 We rent our containers, but since they are new, we usually require a minimum committment period of one year. We are pleased to agree a purchase price with you so that you can buy the container at anytime after delivery, if you so wish. We aim to be highly flexible in our purchase offers to you; so do not hestiate to discuss your specific requirements with us.